In this project we have used the RPython infrastructure to generate an RPython JIT for a less-typical use-case: string pattern matching. The work in this project is based on Parsing Expression Grammars and LPeg, an implementation of PEGs designed to be used in Lua. 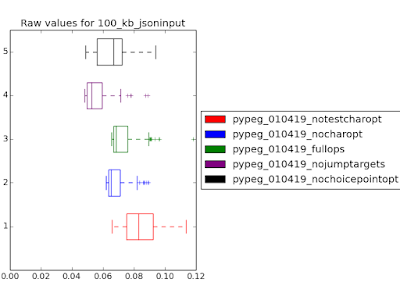 In this post I will showcase some of the work that went into this project, explain PEGs in general and LPeg in particular, and show some benchmarking results. Parsing Expression Grammas (PEGs) are a type of formal grammar similar to context-free grammars, with the main difference being that they are unambiguous. This is achieved by redefining the ambiguous choice operator of CFGs (usually noted as |) as an ordered choice operator. In practice this means that if a rule in a PEG presents a choice, a PEG parser should prioritize the leftmost choice. Practical uses include parsing and pattern-searching. In comparison to regular expressions PEGs stand out as being able to be parsed in linear time, being strictly more powerful than REs, as well as being arguably more readable. LPeg is an implementation of PEGs written in C to be used in the Lua programming language. A crucial detail of this implementation is that it parses high level function calls, translating them to bytecode, and interpreting that bytecode. Therefore, we are able to improve that implementation by replacing LPegs C-interpreter with an RPython JIT. I use a modified version of LPeg to parse PEGs and pass the generated Intermediate Representation, the LPeg bytecode, to my VM. The LPeg Interpreter executes bytecodes created by parsing a string of commands using the LPeg library. 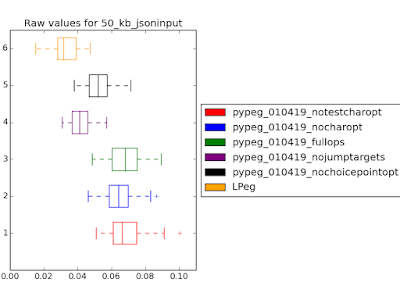 Our JIT supports a subset of the LPeg library, with some of the more advanced or obscure features being left out. Note that this subset is still powerful enough to do things like parse JSON. As a simple example, the pattern lpeg.P"ab"+lpeg.P"cd" would match either the string ab or the string cd. To extract semantic information from a pattern, captures are needed. These are the following operations supported for capture creation. These patterns are translated into bytecode by LPeg, at which point we are able to pass them into our own VM. The execution of bytecode manipulates the values of these variables in order to produce some output. How that works and what that output looks like will be explained now. For simplicity’s sake I will not go over every individual bytecode, but instead choose some that exemplify the core concepts of the bytecode set. any: Checks if there’s any characters left in the inputstring. If it succeeds it advances the index and PC by 1, if not the bytecode fails. char c: Checks if there is another bytecode in the input and if that character is equal to c. Otherwise the bytecode fails. set c1-c2: Checks if there is another bytecode in the input and if that character is between (including) c1 and c2. Otherwise the bytecode fails. These bytecodes are the easiest to understand with very little impact on the VM. What it means for a bytecode to fail will be explained when we get to control flow bytecodes. jmp n: Sets PC to n, effectively jumping to the n’th bytecode. Has no defined failure case. testchar c n: This is a lookahead bytecode. If the current character is equal to c it advances the PC but not the index. Otherwise it jumps to n.
call n: Puts a return address (the current PC + 1) on the stackentries stack and sets the PC to n. Has no defined failure case. ret: Opposite of call. Removes the top value of the stackentries stack (if the string of bytecodes is valid this will always be a return address) and sets the PC to the removed value. Has no defined failure case. choice n: Puts a choice point on the stackentries stack. Has no defined failure case. commit n: Removes the top value of the stackentries stack (if the string of bytecodes is valid this will always be a choice point) and jumps to n. Has no defined failure case. The any bytecode is needed because testchar does not consume a character from the input. A choice point consist of the VM’s current index and capturestack as well as a PC. This is not the VM’s PC at the time of creating the choicepoint, but rather the PC where we should continue trying to find matches when a failure occurs later. Now that we have talked about choice points, we can talk about how the VM behaves in the fail state. If the VM is in the fail state, it removed entries from the stackentries stack until it finds a choice point. Then it backtracks by restoring the VM to the state defined by the choice point. If no choice point is found this way, no match was found in the string and the VM halts. Some patterns require the VM to produce more output than just “the pattern matched” or “the pattern did not match”. Imagine searching a document for an IPv4 address and all your program responded was “I found one”. In order to recieve additional information about our inputstring, captures are used. In my VM, two types of capture objects are supported, one of them being the position capture. It consists of a single index referencing the point in the inputstring where the object was created. The other type of capture object is called simplecapture. It consists of an index and a size value, which are used to reference a substring of the inputstring. In addition, simplecaptures have a variable status indicating they are either open or full. If a simplecapture object is open, that means that its size is not yet determined, since the pattern we are capturing is of variable length. Fullcapture Position: Pushes a positioncapture object with the current index value to the capture stack. Fullcapture Simple n: Pushes a simplecapture object with current index value and size=n to the capture stack. Opencapture Simple: Pushes an open simplecapture object with current index value and undetermined size to the capture stack. closecapture: Sets the top element of the capturestack to full and sets its size value using the difference between the current index and the index of the capture object. These, and many more bytecodes were implemented in an RPython-interpreter. By adding jit hints, we were able to generate an efficient JIT. We will now take a closer look at some implementations of bytecodes. The code for the any-bytecode is relatively straight-forward. It either advances the pc and index or sets the VM into the fail state, depending on whether the end of the inputstring has been reached or not. The char-bytecode also looks as one would expect. If the VM’s string index is out of range or the character comparison fails, the VM is put into the fail state, otherwise the pc and index are advanced by 1. As you can see, the character we’re comparing the current inputstring to is stored in the instruction object (note that this code-example has been simplified for clarity, since the actual implementation includes a jit-optimization that allows the VM to execute multiple successive char-bytecodes at once). The jmp-bytecode comes with a goto value which is a pc that we want execution to continue at. As we can see here, the choice-bytecode puts a choice point onto the stack that may be backtracked to if the VM is in the fail-state. This choice point consists of a pc to jump to which is determined by the bytecode. But it also includes the current index and captures values at the time the choice point was created. An ongoing topic of jit optimization is which data structure is best suited to store choice points and return addresses. Besides naive implementations of stacks and single-linked lists, more case-specific structures are also being tested for performance. In order to find out how much it helps to JIT LPeg patterns we ran a small number of benchmarks. We used an otherwise idle Intel Core i5-2430M CPU with 3072 KiB of cache and 8 GiB of RAM, running with 2.40GHz. The machine was running Ubuntu 14.04 LTS, Lua 5.2.3 and we used GNU grep 2.16 as a point of comparison for one of the benchmarks. The benchmarks were run 100 times in a new process each. We measured the full runtime of the called process, including starting the process. 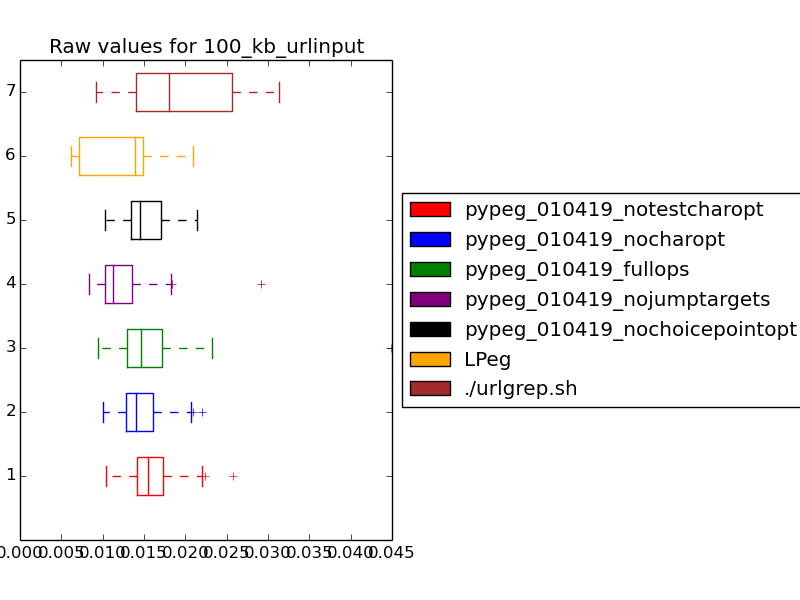 Now we will take a look at some plots generated by measuring the runtime of different iterations of my JIT compared to lua and using bootstrapping to generate a sampling distribution of mean values. 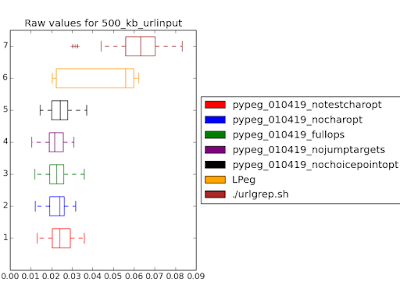 The plots contain a few different variants of pypeg, only the one called "fullops" is important for this blog post, however. 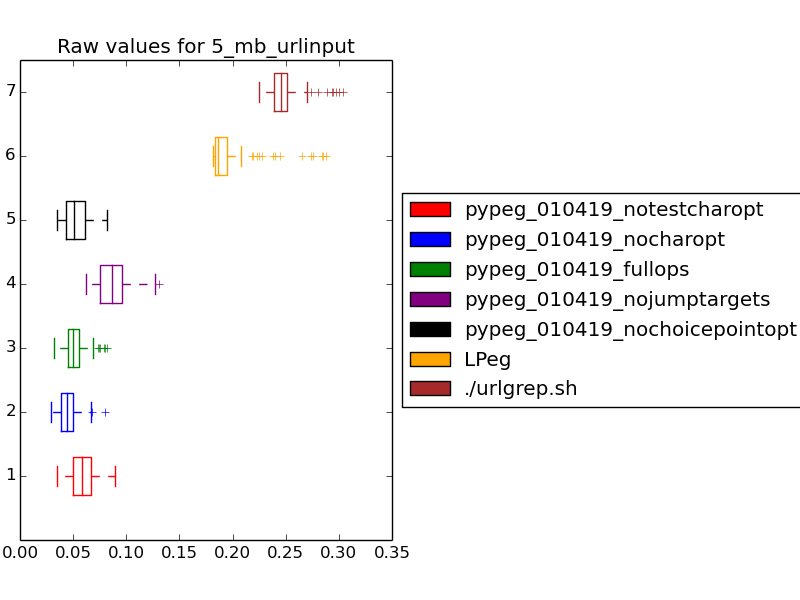 This is the plot for a search pattern that searches a text file for valid URLs. As we can see, if the input file is as small as 100 kb, the benefits of JIT optimizations do not outweigh the time required to generate the machine code. As a result, all of our attempts perform significantly slower than LPeg. 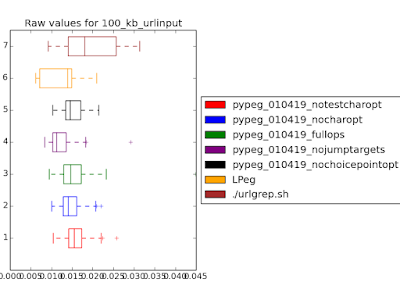 This is the plot for the same search pattern on a larger input file. 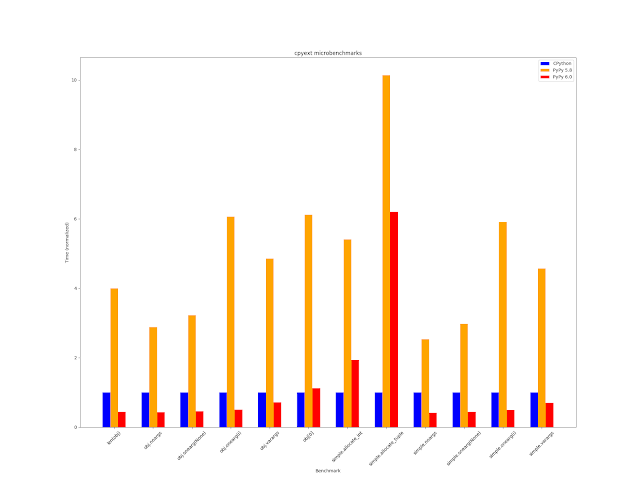 As we can see, for input files as small as 500 kb our VM already outperforms LPeg’s. An ongoing goal of continued development is to get this lower boundary as small as possible. The benefits of a JIT compared to an Interpreter become more and more relevant for larger input files. Searching a file as large as 5 MB makes this fairly obvious and is exactly the behavior we expect. This time we are looking at a different more complicated pattern, one that parses JSON used on a 50 kb input file. As expected, LPeg outperforms us, however, something unexpected happens as we increase the filesize. Since LPeg has a defined maximum depth of 400 for the choicepoints and returnaddresses Stack, LPeg by default refuses to parse files as small as 100kb. This raises the question if LPeg was intended to be used for parsing. 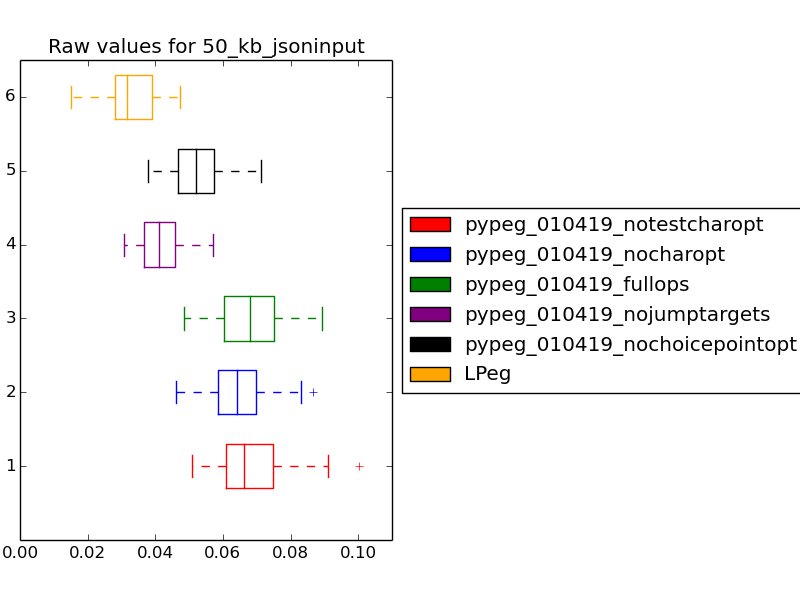 Until a way to increase LPeg’s maximum stack depth is found, no comparisons to LPeg can be performed at this scale. This has been a low priority in the past but may be addressed in the future. 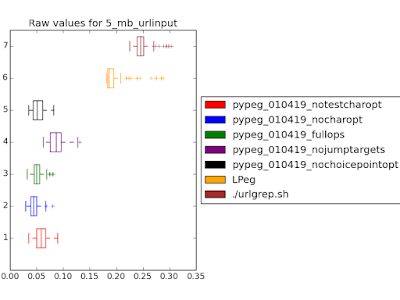 To conclude, we see that at sufficiently high filesizes, our JIT outperforms the native LPeg-interpreter. This lower boundary is currently as low as 100kb in filesize. 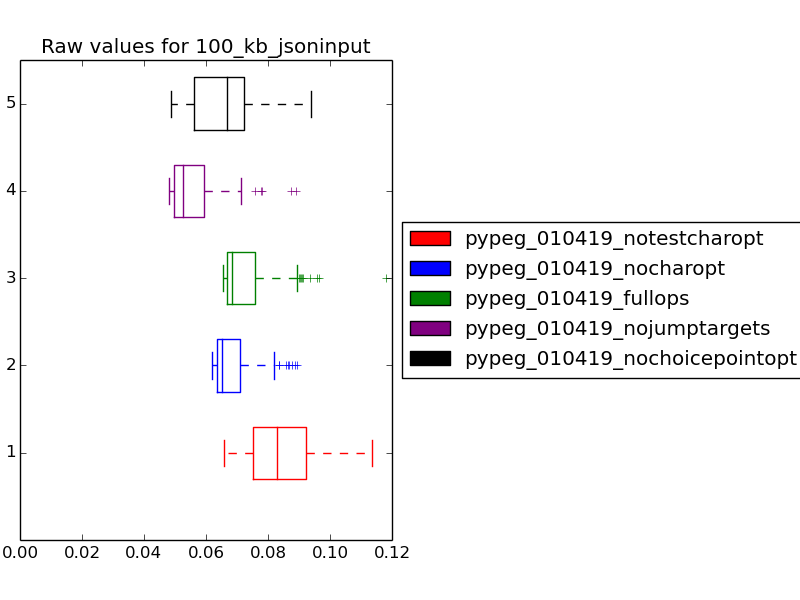 Writing a JIT for PEG’s has proven itself to be a challenge worth pursuing, as the expected benefits of a JIT compared to an Interpreter have been achieved. Future goals include getting LPeg to be able to use parsing patterns on larger files, further increasing the performance of our JIT and comparing it to other well-known programs serving a similar purpose, like grep. The prototype implementation that I described in this post can be found on Github (it's a bit of a hack in some places, though). Recently I have merged the gc-disable branch, introducing a couple of features which are useful when you need to respond to certain events with the lowest possible latency. This work has been kindly sponsored by Gambit Research (which, by the way, is a very cool and geeky place where to work, in case you are interested). Note also that this is a very specialized use case, so these features might not be useful for the average PyPy user, unless you have the same problems as described here. The PyPy VM manages memory using a generational, moving Garbage Collector. Periodically, the GC scans the whole heap to find unreachable objects and frees the corresponding memory. Although at a first look this strategy might sound expensive, in practice the total cost of memory management is far less than e.g. on CPython, which is based on reference counting. While maybe counter-intuitive, the main advantage of a non-refcount strategy is that allocation is very fast (especially compared to malloc-based allocators), and deallocation of objects which die young is basically for free. More information about the PyPy GC is available here. As we said, the total cost of memory managment is less on PyPy than on CPython, and it's one of the reasons why PyPy is so fast. 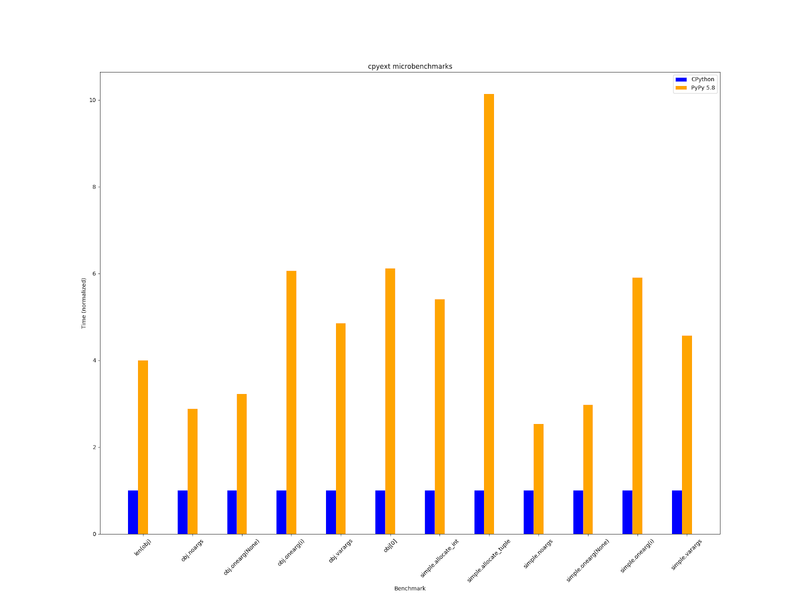 However, one big disadvantage is that while on CPython the cost of memory management is spread all over the execution of the program, on PyPy it is concentrated into GC runs, causing observable pauses which interrupt the execution of the user program. To avoid excessively long pauses, the PyPy GC has been using an incremental strategy since 2013. The GC runs as a series of "steps", letting the user program to progress between each step. The orange line shows the total memory used by the program, which increases linearly while the program progresses. Every ~5 minutes, the GC kicks in and the memory usage drops from ~5.2GB to ~2.8GB (this ratio is controlled by the PYPY_GC_MAJOR_COLLECT env variable). The purple line shows aggregated data about the GC timing: the whole collection takes ~1400 individual steps over the course of ~1 minute: each point represent the maximum time a single step took during the past 10 seconds. Most steps take ~10-20 ms, although we see a horrible peak of ~100 ms towards the end. We have not investigated yet what it is caused by, but we suspect it is related to the deallocation of raw objects. These multi-millesecond pauses are a problem for systems where it is important to respond to certain events with a latency which is both low and consistent. If the GC kicks in at the wrong time, it might causes unacceptable pauses during the collection cycle. You can clearly see that the baseline response time is around ~20-30 ms. However, we can also see periodic spikes around ~50-100 ms, with peaks up to ~350-450 ms! After a bit of investigation, we concluded that most (although not all) of the spikes were caused by the GC kicking in at the wrong time. gc.disable(), which previously only inhibited the execution of finalizers without actually touching the GC, now disables the GC major collections. After a call to it, you will see the memory usage grow indefinitely. gc.collect_step() is a new function which you can use to manually execute a single incremental GC collection step. It is worth to specify that gc.disable() disables only the major collections, while minor collections still runs. Moreover, thanks to the JIT's virtuals, many objects with a short and predictable lifetime are not allocated at all. The end result is that most objects with short lifetime are still collected as usual, so the impact of gc.disable() on memory growth is not as bad as it could sound. Combining these two functions, it is possible to take control of the GC to make sure it runs only when it is acceptable to do so. For an example of usage, you can look at the implementation of a custom GC inside pypytools. The peculiarity is that it also defines a "with nogc():" context manager which you can use to mark performance-critical sections where the GC is not allowed to run. The yellow line is the same as before, while the purple line shows the new system: almost all spikes have gone, and the baseline performance is about 10% better. There is still one spike towards the end, but after some investigation we concluded that it was not caused by the GC. Note that this does not mean that the whole program became magically faster: we simply moved the GC pauses in some other place which is not shown in the graph: in this specific use case this technique was useful because it allowed us to shift the GC work in places where pauses are more acceptable. 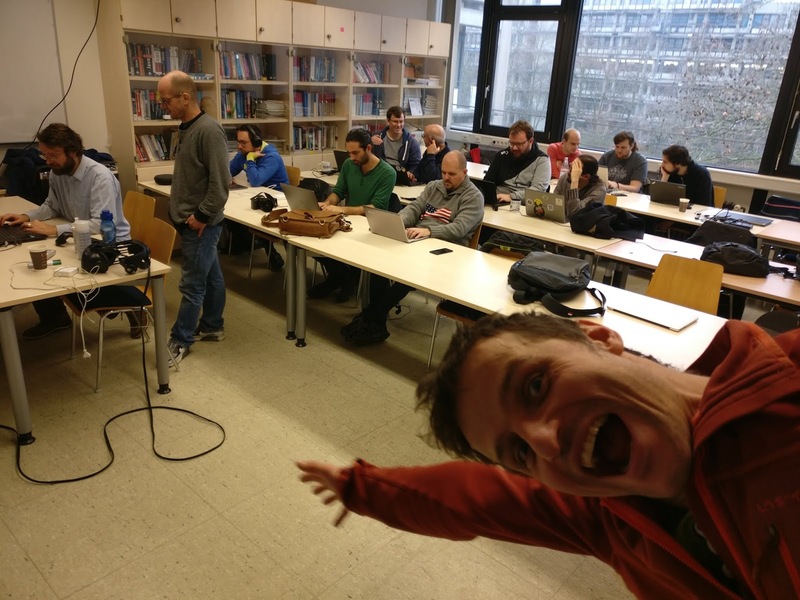 The next PyPy sprint will be held in the Computer Science department of Heinrich-Heine Universität Düsseldorf from the 4th to the 9st of February 2019 (nine years after the last sprint there). This is a fully public sprint, everyone is welcome to join us. packaging: are we ready to upload to PyPI? manylinux2010 - will it solve our build issues? Work days: starting February 4th (10:00), ending February 9th (~afternoon). The break day will probably be Thursday.